After Sunday’s appetizers in Rome and Varna, the main course of the 2018 FIVB Men’s Volleyball World Championships began on Wednesday in 4 locations around Italy and Bulgaria. The most interesting stories of the day came out of Bari, Italy, where many in the building thought conditions were substandard for a tournament of this level (there were several complaints about the conditions in Ruse, Bulgaria as well). Bari was also home to the Pool C match between the U.S. and Serbia. On paper, this was going to be by-far the day’s best match, and it lived up to that billing with the United States eventually coming away with a 3-2 win in what was a back-and-forth match all night. As alluded to above, the USA won a tie-breaker, and the only tie-breaker of the day, over Serbia in Group C 3-2 (15-25, 25-14, 21-25, 25-20, 15-10). 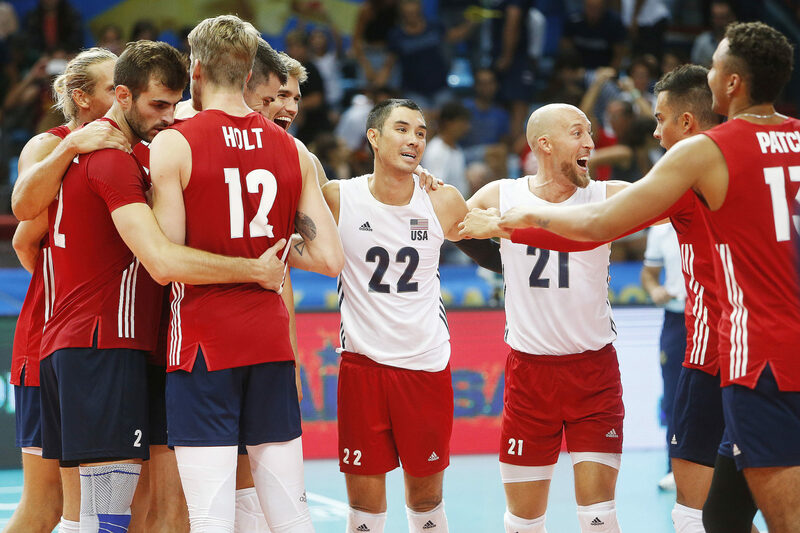 The match was full of big momentum swings, with Serbia overwhelming the US in the first set, but American coach John Speraw stuck with his starters, and they clawed back and took all of that momentum, and then some, back in the 2nd. From there, the teams split sets, before the relentlessness of the American hitters finally overcame the power of the Serbian blockers to win the match. Pool C has 3 teams at the top, Serbia, the US and Russia, that should advance safely through to the next round, but positioning is crucial – avoiding 3rd place in the pool means likely avoiding playing Italy, the heavy favorites in Pool A, in front of 12,000+ fans at the Mediolanum Forum in the 2nd round. In leading Poland to a 3-1 opening win over Cuba, in probably the 2nd-biggest match of the day, 23-year old outside hitter Artur Szalpuk stood out among a crowded group of Polish hitters (that’s going to get a lot more crowded next year when Wilfredo Leon becomes eligible) on Wednesday. He had 17 kills, 1 block, and 2 aces in the match for 20 total points, and hit 58.62% (17/29). He also had 5 digs in the match, playing his defensive part well. He was a bit player for Poland at last year’s European Championship, but is indicative of the massive energy that seems to have pulsed through the team in 2018. The top 4 teams in each pool advance to the 2nd round of the competition. Italy, Slovenia, and Belgium each won with maximum points on day 1. Italy’s 3-0 sweep over Japan was the most significant outcome, and Japan now has a big uphill battle to climb to ensure advancement – they need at least 2 wins in their next 4 matches. to advance. No surprises and lots of sweeps in Pool B. Canada looked like they had their spark back in a dominant 3-0 sweep of the Netherlands (with that spark being, namely, 20-year old Sharone Vernon-Evans) that makes them dangerous in the pool. The big matches start on Thursday, including France vs. Brazil in the night-cap. Cameroon got a huge 3-0 win over continental rivals Tunisia, which gives them a fighting-chance at advancement to the 2nd round. The last African team to get past the first round was Cameroon in 2010, and before that Tunisia in 2006. The easiest way for world #30 Cameroon to get there would be to beat world #16 Australia on Friday. This is only Cameroon’s 4th appearance in the World Championships, after 1990, 2010, and 2014. Poland’s 3-1 win over Cuba pretty much confirmed the order of the top 3 teams in this pool. Finland and Cuba play a big match on Friday, and that will be a big separation match for who will join them in the 2nd round. « Oregon’s Outsides: Who’s It Going to Be?